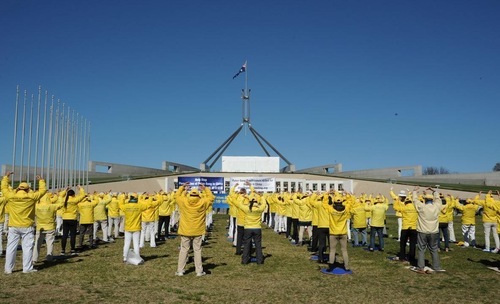 Falun Gong practitioners held a rally in front of the Australian Parliament on September 18, 2018. 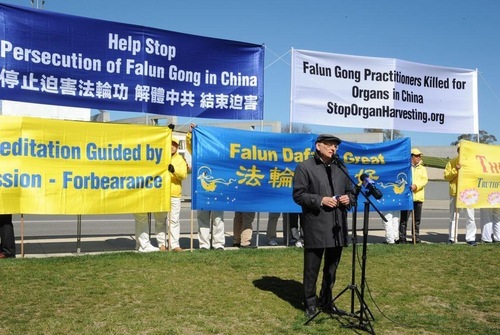 They called on the Australian government, members of Parliament, and the community at large to help stop the Chinese Communist Party’s (CCP) persecution of Falun Gong and the CCP’s state-sanctioned live organ harvesting from prisoners of conscience, most of whom are Falun Gong practitioners. Mr. David Matas, a well-known human rights lawyer from Canada; Mr. Andrew Bush, a human rights activist from Australia; three Falun Gong practitioners from China with personal experience of the persecution; Dr. Wanqing Huang from New York; and Ms. Lucy Zhao, Director of the Australian Falun Dafa Association, all spoke at the rally. Dr. Wanqing Huang from New York speaking at the rally. Events to raise awareness were also held downtown, including the Art of Zhen, Shan, Ren International Exhibition; a screening of documentary films exposing the CCP persecution of Falun Gong; and practitioners distributing flyers at information stands. Ms. Lucy Zhao, Director of the Falun Dafa Association of Australia, said in her speech: “This tribulation began in July 1999. Since then, thousands of Falun Gong practitioners have been arrested and imprisoned and incarcerated in forced labor camps and mental health facilities. They are shocked with electric batons and injected with unknown drugs that damage the central nervous system, just two examples of the many kinds of torture they are subjected to. A Falun Gong information stand downtown. David Matas, a renowned human rights attorney, has been to Australia several times. He made a proposal to the Australian government and Members of Parliament (MP): Face the evidence of the CCP’s live organ harvesting and pass a law to avoid becoming a CCP accomplice. He said he hoped that Australia could change and pass legislation to avoid complicity. In talks with government officials, lawyers, and the medical community, he has shared the progress of his research and let them know that the atrocities are still going on. Well-known human rights lawyer David Matas from Canada speaking at the rally. 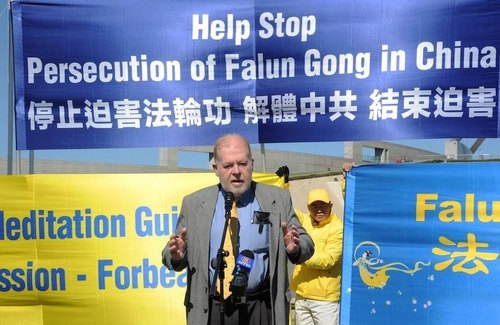 Australian human rights activist Andrew Bush said, “Over the years, Falun Gong practitioners have held activities all over Australia. I have participated in some of these events. These activities are absolutely significant and moving. Australian human rights activist Andrew Bush. One woman at the rally said, “I see them in their yellow shirts, holding banners and practicing in community parks. I can feel their inner peace and silent power. They all try to be good people and do what they can to touch the people around them. 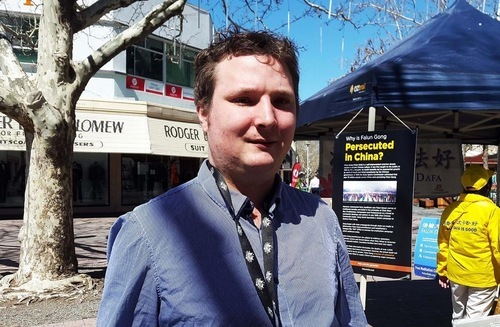 David Johnson saw a Falun Gong stand in the city and stopped to say, “I heard about Falun Gong, the genocide, and the organ harvesting long ago. As a loyal reader of the English Epoch Times newspaper and website, I read a lot about this. Karen, a government employee in the parliament building, said, “I know Falun Gong. I fully support your cause. 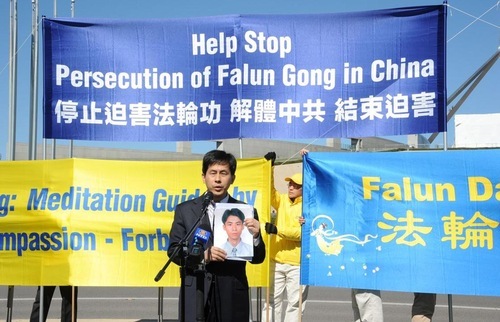 Falun Gong practitioners are brave enough to express their demands. The way you petition is very peaceful and admirable. So I want to congratulate you. You will definitely have a wonderful outcome.